Quick update on BrainJuicer (BJU). Summary: A very respectable set of figures that confirmed this market-research agency has now returned to double-digit growth. However, the group’s best-selling system has started to face “pricing pressure” and the wider competitive advantage may not be as strong as it once was. The statement’s highlight was news of a 12p per share special dividend — the third in four years. The accounts remain in good shape and I continue to hold. Click here for all my previous BJU posts. A trading update during July had already signalled these results would be very respectable. In the event, BJU reported revenue up 12% and gross profit — the firm’s “main top-line indicator” — up 15%. The advances would have been 8% and 11% respectively without favourable currency movements. I was pleased to see BJU’s core products perform well. The wider ‘System1’ division grew by about 25%, within which the Ad Tracking operation grew by about 40%. However, a disappointment was the Predictive Markets service — the group’s largest fee-earner — which recorded a 4% gross-profit drop. It appears rivals have latched on to this money-spinner, with BJU referring to “pricing pressure” and it having to launch a cheaper “express” version. Also of note is that US clients spent 17% more during the six months and now represent 41% of BJU’s gross profit. Indeed, overseas customers contributed 73% to first-half gross profit, which ought to support the group’s second half given the weaker pound. All told, this first-half double-digit progress contrasted notably with that of the previous three first halves. H1 revenue and gross profit growth during 2013, 2014 and 2015 averaged just 5%. I couldn’t really find fault with BJU’s accounts. If you exclude the £264k spent to start a new creative division, then the first-half operating margin was a very acceptable 15% — and two percentage points higher than last year’s H1. Clearly the aforementioned “pricing pressure” is not affecting all of the business. Meanwhile, cash flow continues to excel. Just £90k was spent on fixed assets and only £73k was absorbed into working capital, which left a hefty £1.8m for buybacks (at an average price of 340p) and still leave the balance sheet with net cash of £5.2m (42p per share). The super cash generation and robust bank balance prompted the highlight of the results — a 12p per share special dividend. This payout matches the 12p per share special payments declared during 2013 and 2014. The ordinary interim dividend was lifted 10% to 1.1p per share. Operating profit for the year to June 2016 — excluding the aforementioned start-up costs and charges last year involving an office move — was about £5.1m. Taxed at this H1’s 36% gives earnings of £3.3m or 26.5p per share. Adjusting the £59.3m (at 480p) market cap for the £5.2m net cash position, I arrive at an enterprise value of £54.1m or 438p per share. 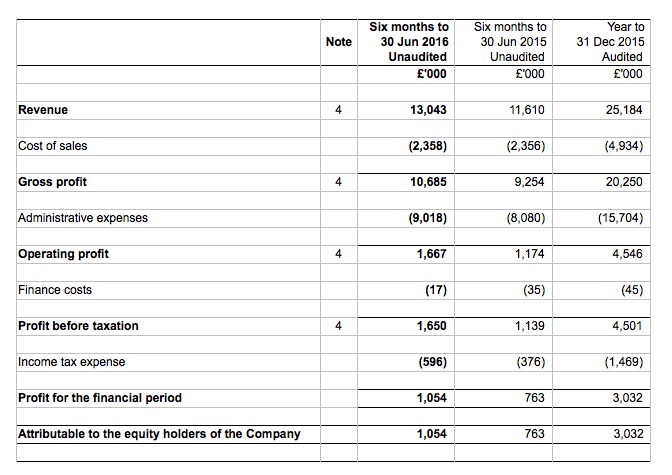 Then dividing that 438p by my 26.5p per share earnings guess gives a P/E of 16-17. I suppose that rating is understandable now the business has returned to double-digit growth after a few years of more modest progress. Meanwhile, the trailing ordinary dividend is 4.6p per share and supports a meagre 1% income. Disclosure: Maynard owns shares in BrainJuicer. This entry was posted in My Shares, System1 and tagged SYS1, System1 on September 16, 2016 by Maynard Paton. “Trading, since the announcement on 16 September 2016 of the Group’s results for the six months ending 30 June 2016, has continued to be strong. Despite the partial recovery in the value of the pound in recent weeks, we are confident that Gross Profit, our main top line indicator, and Pre-tax Profit (normalised and reported) for the twelve months to 31 December 2016, will be above current market forecasts. Our continued strong progress has been underpinned by the excellent performance of our Advertising Testing and Brand Tracking services. As far as I can tell from Sharepad.co.uk, the 2016 pre-tax profit forecast before today was £5.5m to give EPS of 27.5p. If we say pre-tax profit comes to £5.7m — and it was rolling at £5.1m for the year to June 2016 — then EPS comes to almost 30p per share after 36% tax. Adjust this morning’s 540p offer price for 42p per share of cash (to get 498p), and the cash-adjusted P/E comes to 492p/30p = 16-17x. That’s probably a fair reflection of BJU’s recent progress. I suspect a fair chunk of BJU’s H2 performance has been helped by the weaker GBP (about 60% of revenue is earned overseas), but all the same the business appears to be performing well without currency assistance. “BrainJuicer traded strongly during 2016, regaining momentum after the modest growth of the 2 previous years. For the 12 month period, Gross Profit, our main top line indicator, increased by some 27% to approximately £25.6m, driven primarily by continued strong progress by our US business and an encouraging recovery in Continental Europe. Excluding the impact of exchange rate movements the increase in Gross Profit was some 15%. In terms of products, our Advertising Testing and Brand Tracking services again delivered strong growth. In aggregate Gross Profit from these comparatively high margin and scalable quantitative services rose by around 80%, and represented around 39% of BrainJuicer’s total Gross Profit, compared with 27% in 2015. Our System1 creative advertising agency, launched in early 2016, is making an encouraging start with costs net of initial revenues in 2016 on budget at £0.3m. Cost increases, and in particular central overheads, were held well below the rate of Gross Margin growth. Even after a much higher level of bonus payments, compared with a negligible payout in 2015, Pre-tax profit for 2016 is expected to be some 37% higher at around £6.2m, (2015: £4.5m) after a share-based payments charge of £0.5m (2015: £0.2m). In the previous Comment above, I had pencilled in pre-tax profit of £5.7m. BJU’s broker had expected £5.8m. Turns out the figure will be £6.2m. I thought it was reassuring to know that gross profit improved by a very useful 15% before the favourable currency movements. All organic growth, too. I calculate a £6.2m pre-tax profit after 36% tax (the rate applied during H1) gives earnings of 32.5p per share. Adjust this morning’s 660p offer price for the stated 63p per share of cash (to get 597p), and the cash-adjusted P/E comes to 597p/32.5p = 18-19x. That’s probably a fair reflection of BJU’s organic 15% growth rate. The full 2016 figures will be announced in February and ought to be a pleasure to read.